Kumasi Asante Kotoko have placed six players, including Camerounian import, Imbola Sandji, on the transfer list for non-performance. This follows recommendations made to management by the coach, Hans Dieter Schmidt. It is also part of what Kotoko described as the restructuring exercise going on in the club. The other affected players are Joe Louis, Joe Okyere, Kwaku Duah, Isaac Owusu and Stephen Owusu. A statement from the club's secretariat signed by Public Relations Manager, Mr Kwame Owusu Ansah, said five other players have also been loaned to other clubs. They are Anars Mohammed to Feyenoord; Francis Aggrey and Osei Kwame Jnr to Berekum Arsenals; Patrick Dodoo and Abedi Sarfo to B/A United.The statement said two players previously on loan to other clubs have been recalled. They are Fuseini Adams, who was with B/A United, and Frank Asoah with Berekum Arsenals. The statement said any club interested in the transfer-listed players or those on loan should contact the management of Kotoko for negotiations at the club's secretariat. Giving further explanation for the action, Mr Owusu-Ansah told the Graphic Sports on phone that the transfer-listed players had not been active for some time now due to many reasons he would not disclose.He stated that their presence in the team was only having a toll on the club's finances. 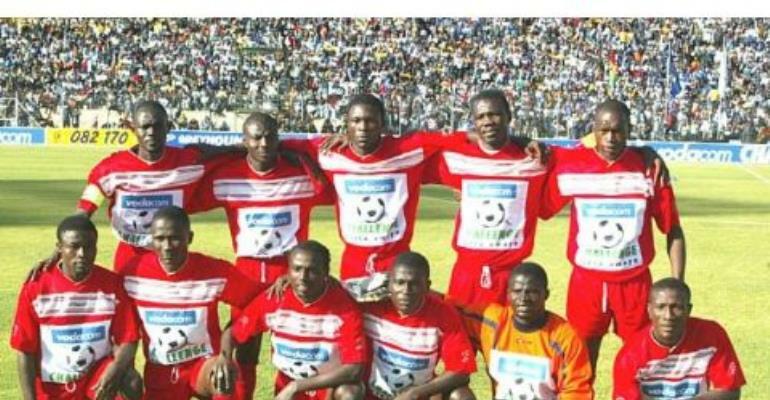 He said the player population of over 40 was too much for Kotoko to bear and believed it was right to transfer those who could not fit into the system.It is a fact that all the players on transfer have seen little or no action for some time now. Apart from Imbola Sandji who sometimes came on as a substitute in matches, the rest have virtually been absent since the last season. Early this year, Joe Louis was said to be contemplating a move to Accra Hearts of Oak. One player who disappointed many was Francis Aggrey, aka Mboma. He was plucked from Berekum Arsenals at the beginning of the last season amidst the strong belief to the key to solving the striking problems of Kotoko. But he failed to gain selection for almost the whole season. Mr Owusu-Ansah said those given on loan are young and Kotoko took that action with the hope that they could improve on their performance and return to the club in due course. Meanwhile, Ashantigold have sworn to add to the woes of Kotoko tomorrow when the two sides clash in the top Zone A liner of the Kinapharma Premier league at the Obuasi Len Clay Stadium. A source close to the club told the Graphic Sports in Kumasi at the weekend that Ashantigold take the match very serious since they do not want to drop any more points, having drawn their opening match against Bofoakwa at Sunyani last week.